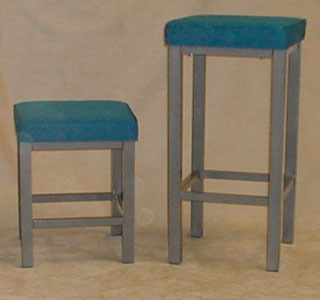 A Custom Designed Vanity Stool and Bar Stool for The Elm Street Lounge in Chicago, IL. Notice the clean lines for easy dusting and cleaning. Easy seat removal to replace damaged seats. Use of machine screws and "T" nuts so that the screws will not loosen up and fall out. Heavy wall 16 gauge tubing for deep penetration clean welds. Butyl glides for long lasting wear. Powder coated for long chip resistant finish.